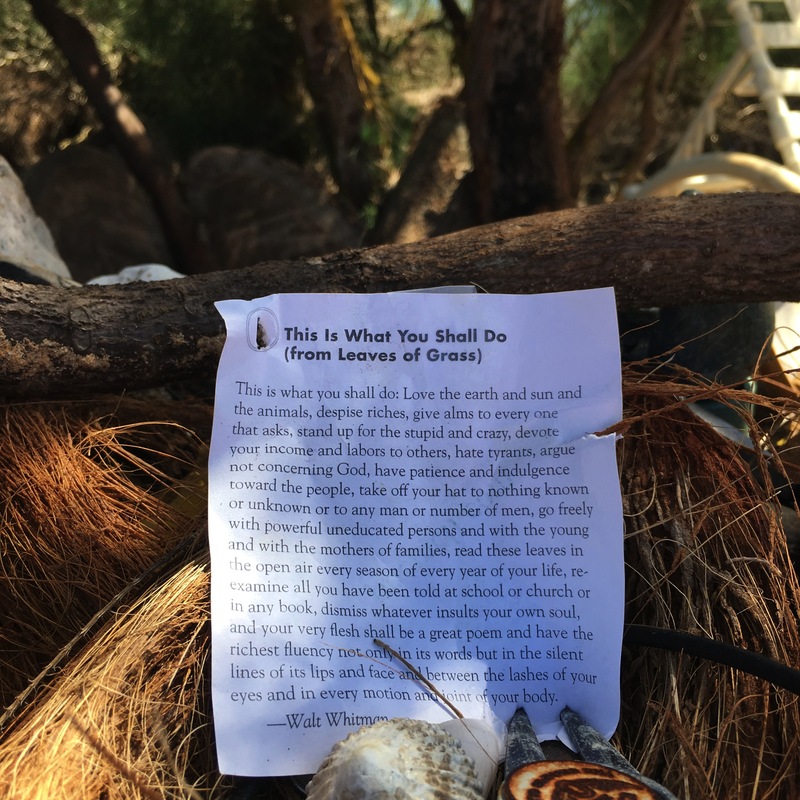 A few weeks back I left this excerpt from Walt Whitman’s Leaves of Grass on the Maha’ulepu Trail on the island of Kauai. 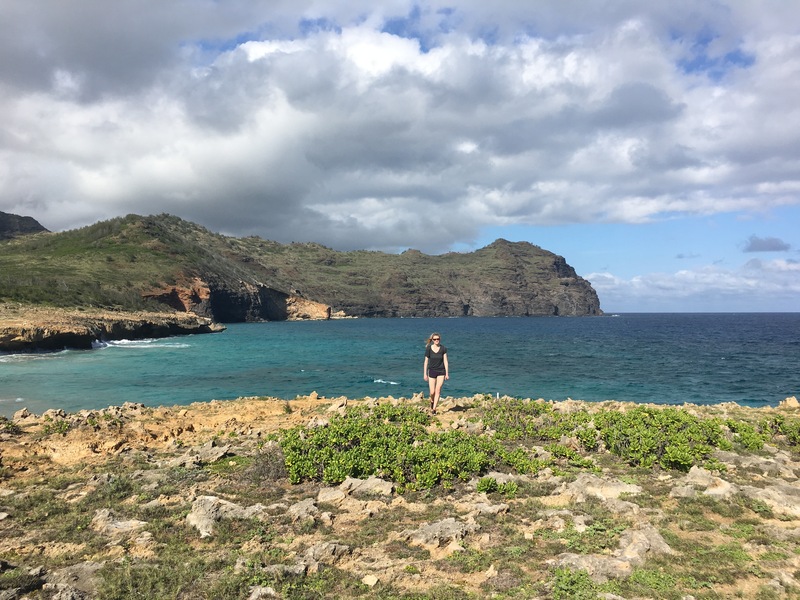 Maha’ulepu is revered not only as the last undeveloped coastline in southern Kauai, but also as a Hawaiian heritage site, with ancient burial grounds, ruins of a heiau (Hawaiian temple), and the bones of extinct species still being discovered. The trail, 8 miles round trip, runs along limestone cliffs high above the crashing surf, dropping to empty beaches and rising up again. On one side of the trail are ancient fossils, petroglyphs, and caves, and on the other a lush golf course and mountain view. Each turn of the sandy path brings an ever more beautiful view. It was tough to decide where to leave the poem I carried in my pocket. 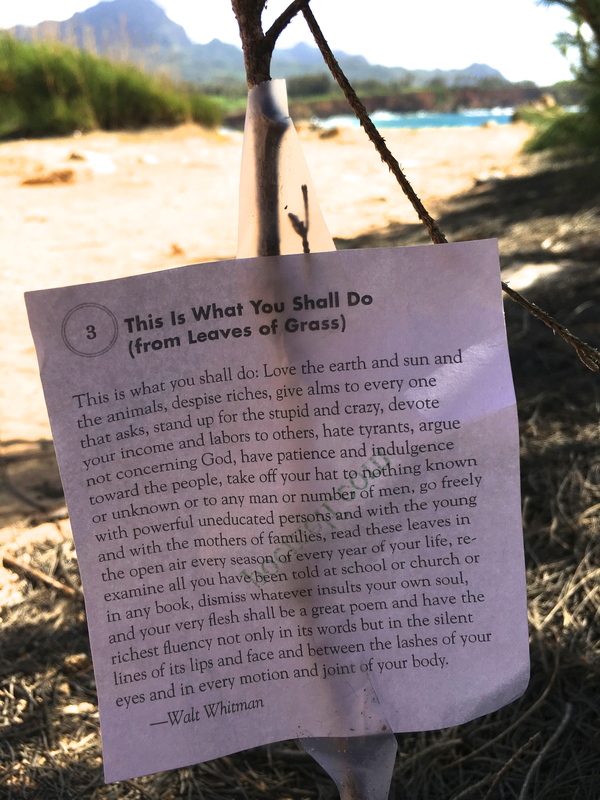 I first attached it to a twig and stuck it in the sand, but the day was windy and would quickly turn Whitman’s words into trash. 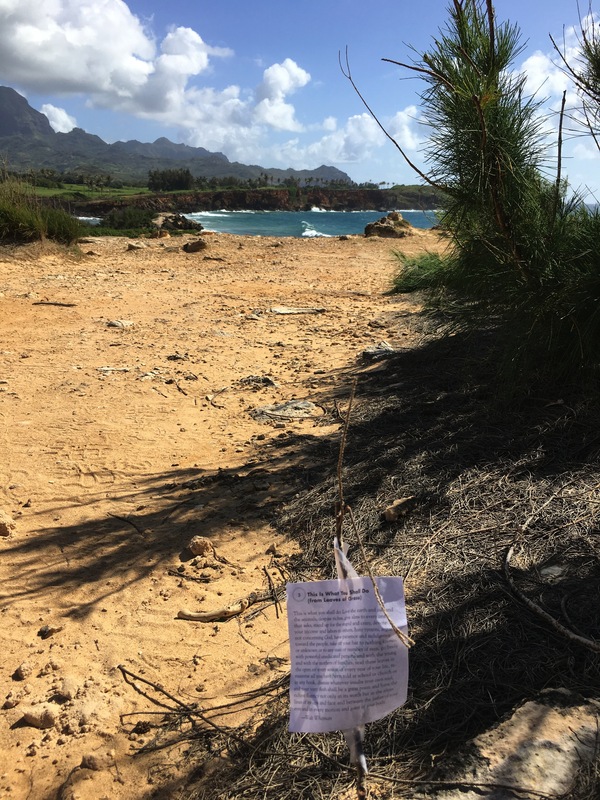 I was not going to be the haole who left trash in a place of such archeological, historical and spiritual significance. So I walked on. 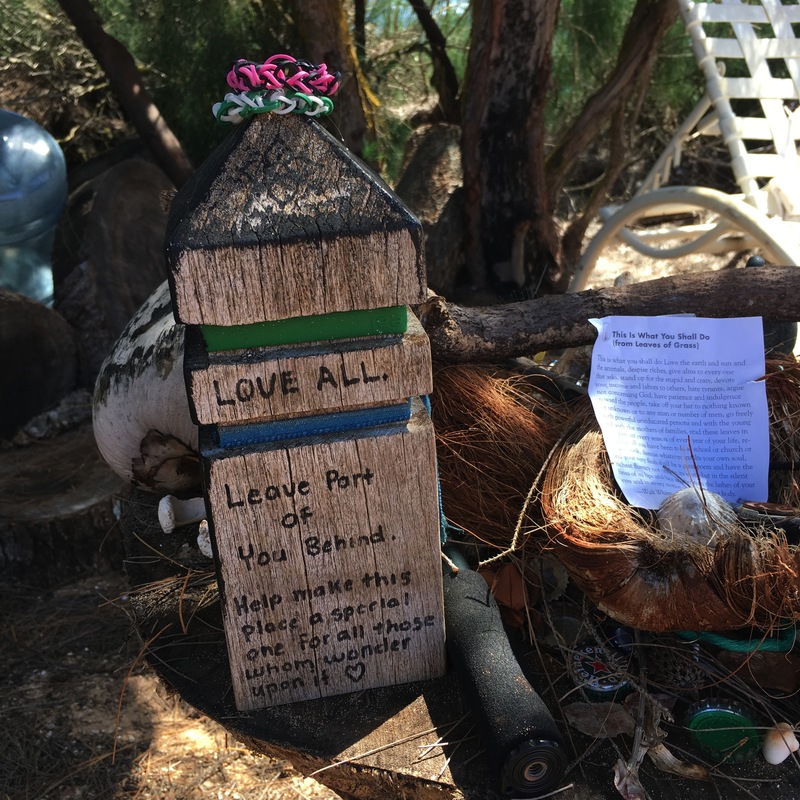 Then I remembered that further up on the trail was a hideaway spot where visitors are encouraged to leave something behind on a makeshift altar to friendship and aloha. So there the prose poem found a home. The echo must be deliberate. The Old Testament structure is the perfect foil for the new American commandments Whitman offers. In place of ten commandments, he gives twelve. In place of Thou shalt not’s (eight of the ten, anyway), he offers You shall. His commands are all stated affirmatively. And then there’s the content, which is anti-command-following, at least anti the rules people of his time were accustomed to. Re-examine, dismiss, he says, take off your hat to nothing known or unknown. And this, my hands-down favorite: STAND UP FOR THE STUPID AND CRAZY. I put it in all caps because in this age of extreme division, it needs to be shouted. People of all political persuasions would do well to think, STAND UP FOR THE STUPID AND CRAZY, every time they encounter views opposite their own. The covenant, too, differs sharply from the one in Exodus. The Israelites’ “reward” for following the commandments was to be called God’s chosen people. 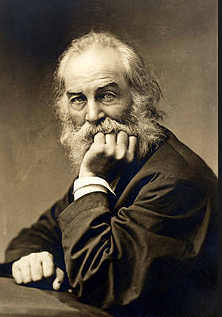 The reward for following Whitman’s is to be called a poem, a living, breathing poem. From between the lashes of your eyes to every joint in your body the flesh becomes word and not the other way around. Because I left Whitman’s piece in Hawaii, an unlikely spot if there ever was one for the words of a native New Yorker, I can’t help but think of another set of commandments. Or to put it differently, another guide for righteous living. I’m talking about the Aloha Spirit, and it’s got nothing to do with leis and hula dancers. Hawaiians take the Aloha Spirit so seriously they even put it in their state constitution. Even though it’s long and will stretch the length of this post past anyone’s patience, I want to print the law in whole. 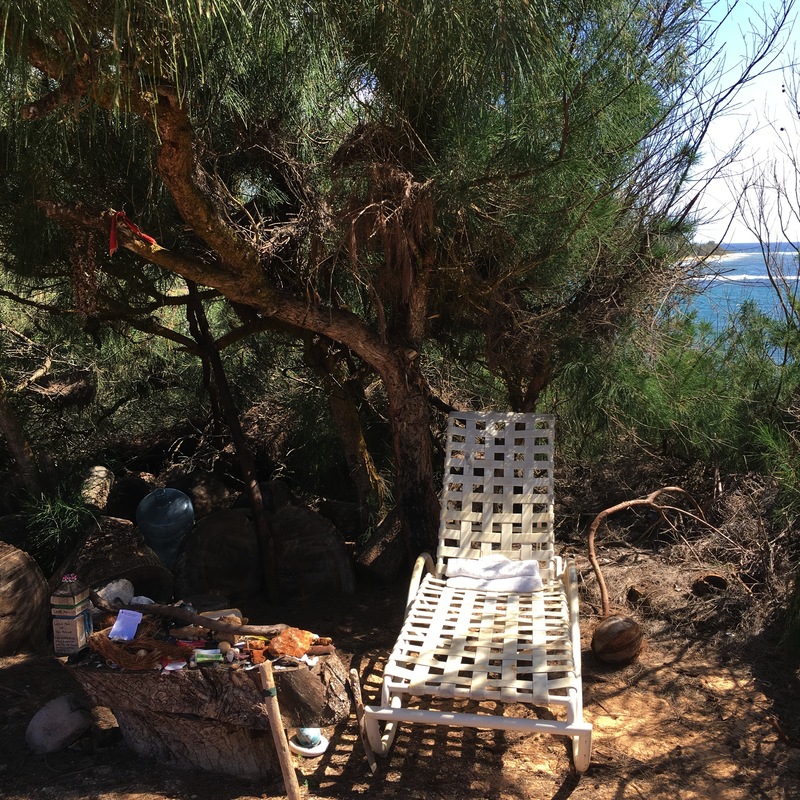 I leave it to others to write the dissertation on how Whitman’s philosophy relates to the A.S. law–I only suggest that although one celebrates the individual and the other a culture of collectivism, both place a high value on connection, authenticity and the spiritual aspects of life. * Ahonui, meaning patience, to be expressed with perseverance. * Aloha is more than a word of greeting or farewell or a salutation. * Aloha means mutual regard and affection and extends warmth in caring with no obligation in return. * Aloha is the essence of relationships in which each person is important to every other person for collective existence. * Aloha means to hear what is not said, to see what cannot be seen and to know the unknowable. Walt Whitman (1819-1892) was born in Long Island, the second of nine children. His mother and his father, a carpenter, were sympathetic to Quaker thought but never actually became Quakers. The same is true of Whitman throughout his life. The family was poor and forced to move often. When he was eleven Whitman quit school and started to work, first as an office boy in a lawyer’s office and then as an apprentice to a printer, where he stayed till he was seventeen. He taught in a one-room schoolhouse for five years, and in his early twenties became a full-time journalist and started a weekly newspaper. He worked as an editor for newspapers in Brooklyn, Long Island and New Orleans. Meanwhile he was writing the poems that would form the original Leaves of Grass, which he produced and published himself in 1855. The sexual content in the book was controversial—even banned in Boston–and over the years Whitman failed to get work and lost work because of it. During the Civil War he served as a nurse and later as a government clerk. The last eighteen years of his life he faced serious health issues but continued to work on new editions of his masterwork. He published the “deathbed” version only four months before he died at age 72 of tuberculosis. 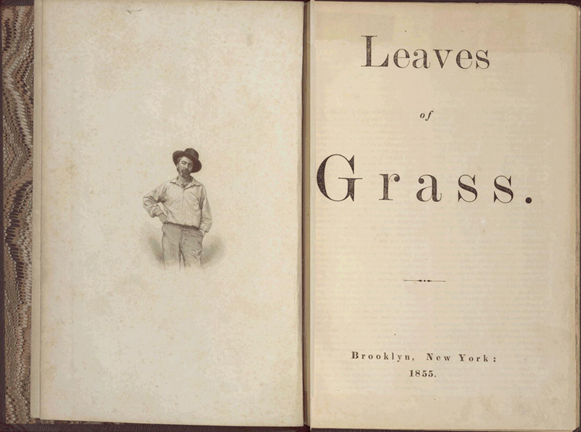 ** If you want to read more about Leaves of Grass, link to this this piece by poet Robert Haas. Interestingly, in the excerpt from his book (scroll down when you link), Haas mentions that poet Galway Kinnell once said that Leaves of Grass is so rich in vowel sounds it might as well have been written in Hawaiian.